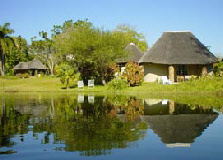 Listen to the Fish Eagles calling as you unwind in secluded and spacious African thatched rondavels. Soak up the warmth of the sun around the pool or pamper yourself in the sauna and Jacuzzi. Idle & Wild is on a working macadamia farm bordering the Sabie River. Peaceful walks can be taken. Idle & Wild is ideally situated for a rejuvenating break in the heart of nature, or exploring the surrounding areas such as Kruger National Park, God’s Window, Bourke’s Luck Potholes, Pilgrims Rest and the many waterfalls. Hot air ballooning, river rafting, horse riding, hikes, bass fishing and cycling are just some of the activities in the area. 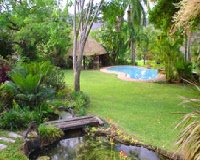 The two thatched rondavels each have two ¾ size beds, shower en suite and kitchenette equipped with a bar fridge, microwave, kettle, cutlery, and crockery set in tranquil sub-tropical garden. Each rondavel has its own braai (barbecue) facility; ideal for those days you don’t want to go out for dinner. 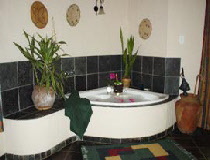 Our cottage is ideal to accommodate four people. 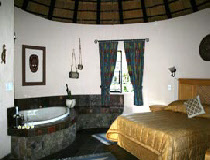 The main bedroom has a queen size bed and bath and shower en suite. The bedroom upstairs has two single beds and shower en suite. The lounge with a fireplace and fully equipped kitchen (2 plate stove) opens onto a patio with braai (barbeque) facility overlooking the valley, from where you can enjoy the beautiful sunsets and mountain views. The sunbird room is adjoined to the Main House. The open plan room has one queen size bed with bath en suite, air-Conditioner, lounge area with TV , (Sabc & E-tv - please bring your own smart card should you wish to view the entire spectrum of DSTV) and a semi-kitchenette equipped with a bar fridge, microwave, kettle, toaster, cutlery & crockery. Separate small room with bunk beds, toilet & basin. The room has 2 entrances, one entrance is close to reception and the other from a private court yard with braai facility. The Sunbird room is ideal to accommodate a Family travelling together. 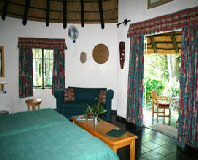 The Fish Eagle Room is adjoined to the Main house, it is a delightful large room with two single beds side by side. Bathroom en suite with bath and shower. air-Conditioner, lounge area with TV. ( Sabc & E-tv - please bring your own smart card should you wish to view the entire spectrum of DSTV) and a semi- Kitchenette equipped with a bar fridge, microwave, kettle, toaster, cutlery and crockery. The Room has 2 entrances, one entrance is close to reception and the other is off a private court yard with braai facilities. A full English breakfast is served on the veranda of the main house, or a Continental breakfast can be placed in your unit fridge to be enjoyed at your leisure on your verandah. Should you wish to make an early start to the Kruger National Park, a packed breakfast will be provided. • Assistance with activities and route planning. • German, English & Afrikaans Spoken. 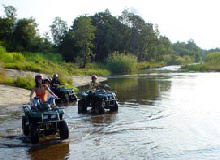 We offer the excitement of quad bike trails in the scenic riverine area in and around the Sabie River Valley and the bushveld surrounding the Kruger National Park. An experienced guide leads all trails. Your guide will teach you and ensure that you are at ease with the controls before departure. • Trails depart from 10am-5pm. We are pleased to announce the opening of Nkosi Adventures! The trips start at 09h00, 12h00 & 15h00 and we operate 7 days a week. 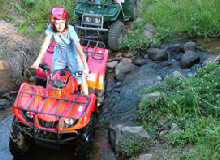 Duration is approximately one and a half hours and the cost is R230 per person.